With Motorola expected to unveil at least one new phone during its July 25th event, one model that is a possibility to be announced in New York City on that date is the Moto Z2 Force. 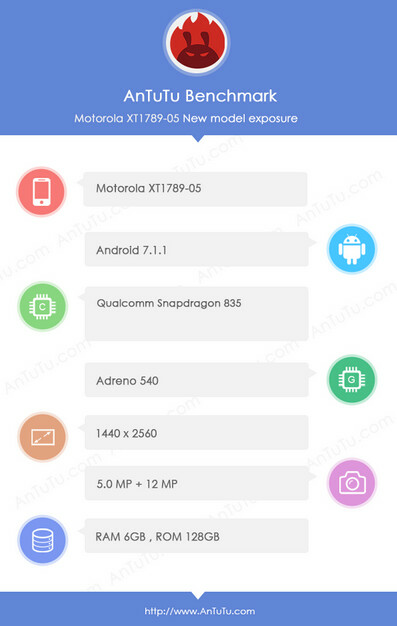 Today, the second-generation model has been spotted on the AnTuTu benchmark site under the model number XT-1789-05. Before we run down the specs, we need to make one assumption, and that is to expect a 5.5-inch AMOLED screen on the device. That would match the specs of the screen used on last year's model. According to AnTuTu, the resolution of the display will be 1440 x 2560 (QHD). The current top-of-the-line Snapdragon 835 chipset is under the hood, carrying an octa-core CPU and the Adreno 540 GPU. This model was tested with 6GB of RAM and 128GB of native storage, which suggests that there will also be a variant with 4GB of RAM along with 64GB of internal storage. Leaked images of the Z2 Force reveal a dual-camera setup on back. Thus, we need to take note of the AnTuTu listing which shows a 12MP rear-facing camera and a 5MP front-facing selfie snapper. Considering that previous rumors called for the dual cameras to weigh in at 12MP each, the AnTuTu report could still be right on. It is worth noting that last year's Moto Z Force sported a 21MP single camera on back. Android 7.1.1 is pre-installed. We've already seen an AT&T branded version of the Moto Z2 Force surface, and T-Mobile also has said that it will carry the device this year. Those two carriers will not get to use the DROID brand, which is a trademark reserved for certain Motorola handsets sold by Verizon. And yes, we certainly do expect Verizon to carry this year the Moto Z2 Play DROID, the Moto Z2 DROID and the Moto Z2 Force DROID. They are really nice specs, especially when you also include the Moto Z forces unbreakable display technology. Not to mention it's also Daydream VR compatible as well. I really hope they put the DROID brand to rest. It hasn't meant much outside of Verizon stores since the RAZR HD (being charitable here.) I'd rather see the Moto brand grow, and yes, getting rid of carrier exclusives can only help. It's absolutely useless, why pay LucasFilm for marketing rights when there's nothing Star Wars related about the phone. And carrier exclusives are insane, by limiting product to select carriers you limit your market, like Google's Pixel being Verizon exclusive, unless you paid the phone off in full from Google. Then again the Pixel couldn't meet the demand for their limited scope of buyers for a few months regardless. What I mean is DROID branding is usually a Verizon exclusive. So if there is a leak with an at&t logo on it, than there is a chance that there isn't any DROID branding. This is nice, I will get this, with the speakers and projector..
Will the Shattershield version be a Verizon exclusive again?